Renewed Repression in Turkey: Take Action Today! 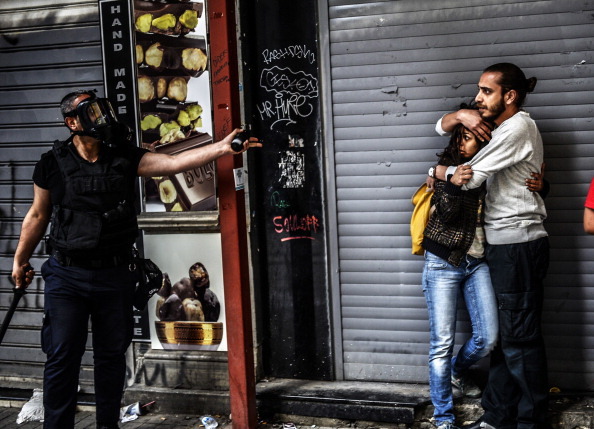 A man protects a woman as they face a police officer dispersing protesters who gathered near Taksim square in Istanbul as the police blocked access to the square during the one year anniversary of the Gezi park and Taksim square demonstrations (Photo Credit: Bulent Kilic/AFP/Getty Images). On the first anniversary of the Gezi Protests and their brutal suppression in Turkey, central Istanbul resembled nothing so much as a city under occupation. Public transportation into the city center was cancelled. Ferry service from the Asian to the European side of the metropolis was ended by the late afternoon. You could leave, but you couldn’t come back. This is the image of the new Turkey, where dissent is stifled with overwhelming force and massive police presence. There seems to have also been sporadic efforts to limit foreign press access. CNN’s Ivan Watson was briefly detained – and apparently kicked – during a live feed. Isobel Finkel of Bloomberg reports in a tweet that she and another journalist were repeatedly asked at checkpoints whether they were foreign or local press. When they said foreign, they were turned away. CNN International made an eight-hour broadcast during last year’s Gezi events. Why? To stir trouble in my country. This year, they have been caught red-handed…Those don’t have anything to do with independent and impartial media. They have been given tasks. They are agents. Phalanxes of heavily armed police blocked every artery into Taksim Square and lined all the major streets in Taksim and Besiktas. On the side streets, reserves were waiting. They were there to ensure that no repeat of last year’s protest would be possible and to demonstrate the state’s overwhelming capacity to stifle dissent. Turkish media reported that as many as 25,000 police and fifty water cannon trucks had been mobilized to control the Taksim area. This use of massive police power, already employed during the suppression of the May 1 demonstrations, uses overwhelming numbers to preclude any possibility of demonstrations. I was meeting Andrew Gardner, Amnesty International’s researcher on Turkey, to observe events and witness any human rights violations. We discussed options and decided that he would stay in the area around Taksim, where the major demonstration was planned, while I would go to Besiktas, which had been the scene of significant violence last year. For the hours that I observed, Besiktas was relatively quiet. A small group of perhaps 150 protesters gathered around Kartal Square, but eventually dispersed in the face of police forces that were at least ten times their number. Turkish news reports indicate that groups attempting to make their way to Taksim later in the evening were stopped, with some arrests. Late in the evening, I heard the sound of pots and pans being banged from windows, a popular means for voicing dissent during last year’s protests. By early evening, however, Gardner saw events in Taksim coming to a head: Taksim Solidarity, a major coalition of civil society organizations, organized demonstrators in a sit down protest, calling on police to remove the barricades. 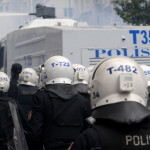 At around seven o’clock police began to employ water cannon, tear gas, and plastic bullets against the small group of protesters who had managed to make it to Istiklal. Social media reported similar crackdowns in other parts of Istanbul and in other cities, particularly Ankara, Izmir, and other cities throughout Turkey. As always, there were a large number of arrests, including one member of Amnesty Turkey who was briefly detained. We have received multiple reports of lawyers and journalists being ill treated by the police. The anniversary of the Gezi crackdown was commemorated – tragically, but perhaps appropriately – with yet another demonstration of the Turkish government’s willingness to use excessive force to suppress its citizenry’s rights to freedom of expression and assembly. In a report that will be released next week, Amnesty will detail the extent to which such crackdowns have become the unhappy norm in a country which not too long ago was lauded as “a democratic model for the Middle East.” Amnesty’s report will also highlight the extent to which police abuse – even abuse that results in death or serious injury – has largely remained immune to effective prosecution. In contrast, prosecutors have brought thousands of cases against individuals for their participation in peaceful protests. In the upside down world of Turkish justice, murderers walk free while Twitter messages risk lengthy prison terms. It is urgent that we not remain silent in the face of this on-going suppression of rights. As the state moves forward with a major case against Taksim Solidarity, join us in lending your voice against police violence and for the right to freedom of expression in Turkey. It is easy, and the more voices are added, the louder we will be heard. This entry was posted in Censorship and Free Speech, Europe, Military, Police and Arms, Security and Human Rights and tagged amnesty international, censorship and free speech by Howard Eissenstat. Bookmark the permalink. What’s Behind Turkey’s Crackdown on the May 1 Protests?